The Family Library has been given a £10,000 boost to its finances by another charity – Manx Miracles. Manx Miracles is a parent-led charity that raises funds to support children with additional needs and disabilities. It decided to make the donation to help the Family Library and Mobile Library to continue to assist such children through their services. Christian Cowley, Manx Miracles’ treasurer, said the charity decided to do its bit to help with the Family Library’s finances after spotting the call for funding support earlier this year. The annual costs to run the Family Library, Mobile Family Library and Schools Service – which is itself a charity – come to £250,000. A family trust has pledged to match pound for pound any money raised up to £125,000 over each of the next three years and, this summer, the government pledged £100,000 to enable the services to keep running for the coming year, in doing so acknowledging the vital role the Family Library plays in the community. 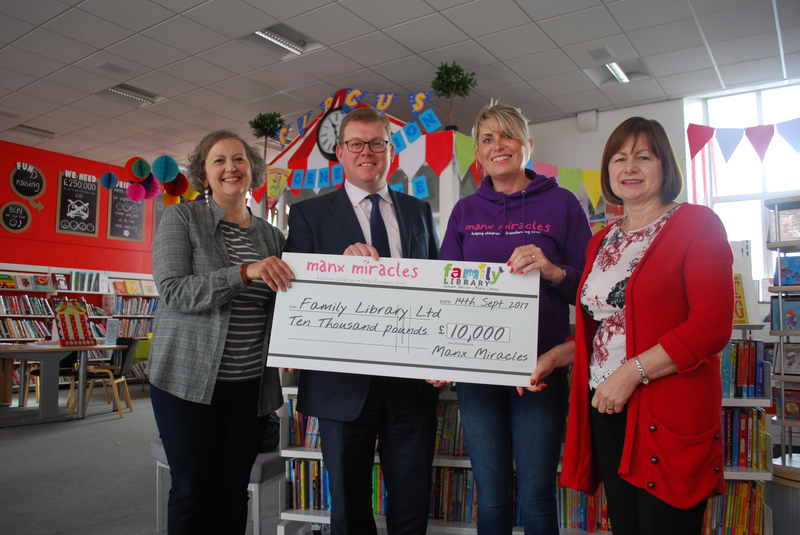 Mary Cousins, librarian-in-charge at the Family Library, said: ‘We are overwhelmed by the generosity of Manx Miracles, a fellow charity, who are so committed to supporting children with additional needs and disabilities. Sandra Henderson, who is librarian-in-charge of the Mobile Library, added: ‘This donation will help us to make a real difference. The Family Library’s website familylibrary.im has details of all its services and the many upcoming events. Gallery | This entry was posted in News and tagged Family Library, Isle of Man, Manx Miracles. Bookmark the permalink.